After a period of indecision and gray skies, the sun decided to come out and kiss the groundbreaking ceremony for the new drive-thru food pantry at The Foodbank. The planned opening of the drive-thru pantry will take place in January of 2018 and will serve the needs of people in the Miami Valley. A smiling crowd of about sixty people gathered to hear the opening remarks of Foodbank CEO Michelle L. Riley. The group included donors, community leaders, and volunteers. Riley’s talk in addition to celebrating the groundbreaking of the drive-thru, covered several topics including the distribution of food from The Foodbank to the victims of Hurricanes Harvey and Irma in Texas and Florida, respectively. In addition to thanking the many Foodbank sponsors that attended the event, Riley also briefly explained the metrics for measuring hunger in Montgomery County and elsewhere. 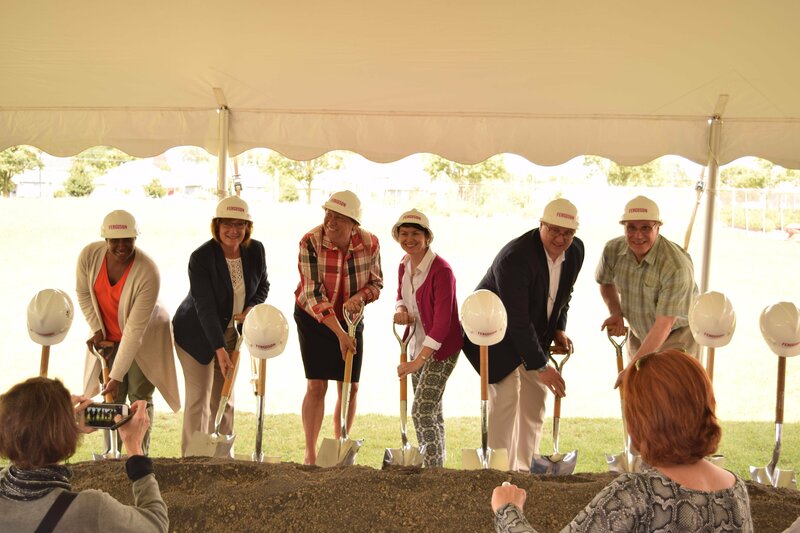 Several pictures were taken of the attendees donning hard hats and plunging their shovels into a large dirt mound to celebrate the event. Jeff King, General Manager, Dayton Office, Austin Dicke, Project Manager of Special Projects, and Project Manager Jeff Comer of Ferguson Construction, the company that built the original Foodbank building in 2013, were there to mark the event. The opening of the pantry drive-thru is a very positive development and “a great opportunity to expand what they do in serving the Dayton, Community,” according to King. Dicke commented that they really enjoyed working with Michelle Riley in the planning of current building and look forward to working with her on the creation of the addition. The Foodbank staff was pleased that Walmart Executive Stan Miller was on hand to celebrate the day, since Walmart is a major sponsor of The Foodbank. Miller, who began his career as an associate in the garden center of the store in Morgantown, West Virginia, is now the Store Manager of the Franklin, Ohio Walmart. According to Miller, Walmart has partnered with Feeding America for nine years and working with The Foodbank of Dayton fills him with joy. “I love the reason for this institution. It’s so simple. We don’t believe that anyone should go hungry,” he exclaimed. Proud teacher Robb Fogg was at the groundbreaking with a cohort of eight students from Kettering Alternative School Program. 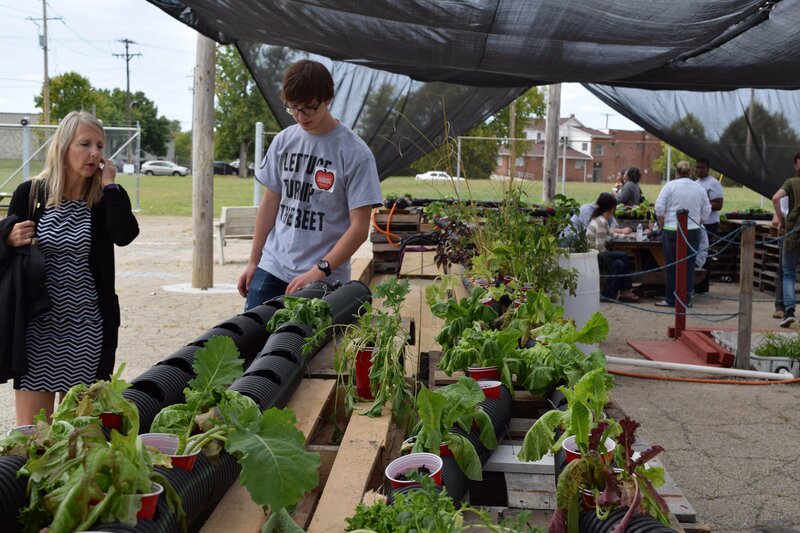 They had just completed an aquaponics system for The Foodbank. The students explained that the process at its most basic level has the waste from the fish being captured by bacteria and converted into fertilizer for the plants in the system. The project was conceptualized one year ago, and the proposal to build a system was presented to an enthusiastic Riley. The students spent several months building the prototype and making adjustments on the black pipe and barrel array according to Riley’s specifications. The grant to complete the project at the Foodbank was provided by the Ardmore Institute of Health and the Montgomery County Solid Waste District. Assistance was also provided by University of Dayton engineering professors Dr. Kellie Schneider and Dr. Felix Fernando, stated Fogg. 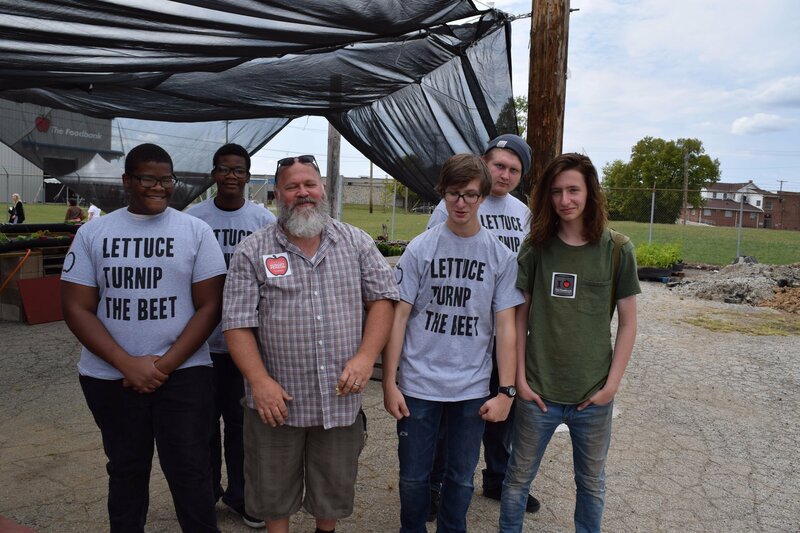 Justin Moore, an aquaponics professional, helped inspire the students to build a new kind of bio filter for the system.